Remember that fable about the blind men who were all standing near an elephant? When they were each asked to describe the elephant, they reached out and touched the part of the animal that was closest to them. They were all right. Sort of. Lots of different perspectives. That’s sort of what AMI is like. 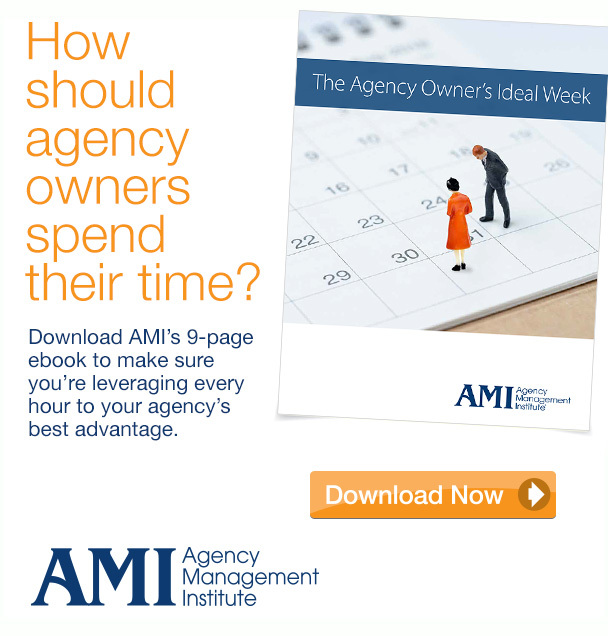 Depending on who you talk to or which testimonial you read, you’ll hear how AMI shows up for that particular owner and how we serve their agency. But it’s probably not the only way. So we decided it would be helpful if we created a graphic that showed you the whole beast, to stick with our story. On the outer ring — we try to produce a lot of really useful, smart content (podcast, blog, research series, webinars, etc.) 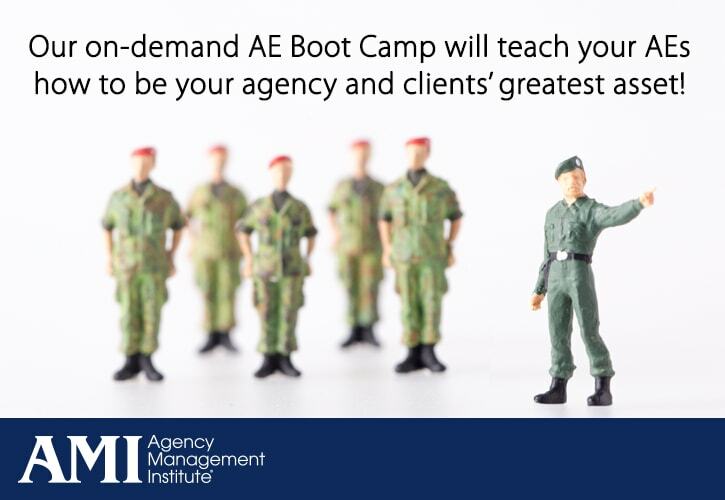 to help you run your agency better and more profitably. You can access all of that for free. 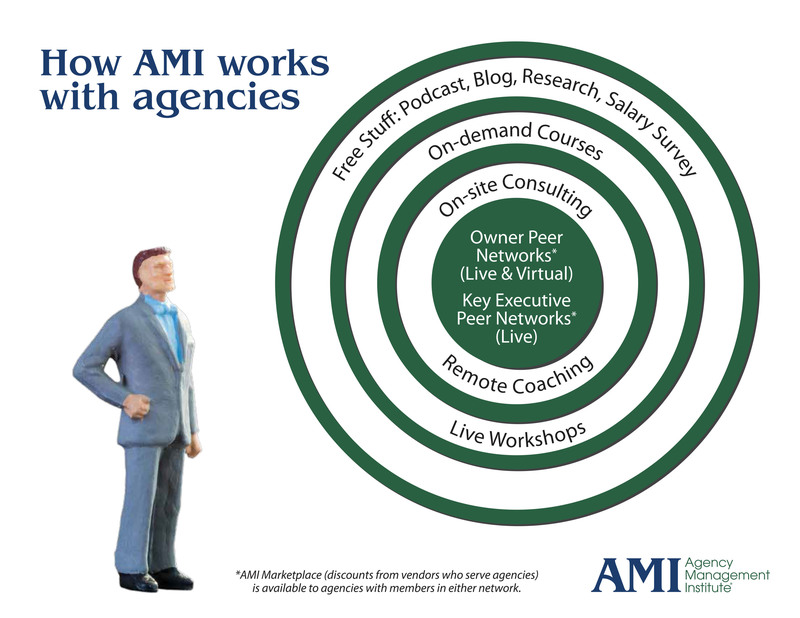 The next layer of AMI is our courses. We offer live workshops and on-demand courses on a variety of topics. That’s a one and done — you pay, you show up and learn and then, if you want, you can be done with us. If you want to go one layer deeper, we offer onsite consulting and remote coaching. We’ll come to you once or on a regular schedule for the onsite consulting. If you prefer a more consistent but remote option, we offer coaching packages where you will work with someone on our team over the course of a year or longer. At the center of AMI are the peer networks. We know how lonely it can be to run an agency and our peer groups create a posse for our owners — a group of other owners they can reach out to, count on and both celebrate and commiserate with. We have two options — a live (2.5 days of intense learning twice a year) or virtual (60-90 minutes every month on Zoom) networks. We have many members who’ve been around for 20+ years and in some cases, we’re on our second or third generation of owners. The owner peer networks are amazing and the owners love them so much they asked us to create a peer group for their right-hand men/women. We call this a key executive group. They meet twice a year in person as well. We also offer some stand-alone products like client satisfaction surveys and our AMI Marketplace, where agencies can access services, SaaS, and products at a special AMI price. If you have questions about any of that — shoot us an email and we’re happy to schedule some time to answer your questions, and learn a little more about your agency.